Fiber optic transceivers combine a fiber optic transmitter and a fiber optic receiver in a single module. They are arranged in parallel so that they can operate independently of each other. Both the receiver and the transmitter have their own circuitry and can handle transmissions in both directions. In fiber optic data links, the transmitter converts an electrical signal into an optical signal, which is coupled with a connector and transmitted through a fiber optic cable. The light from the end of the cable is coupled to a receiver, where a detector converts the light back into an electrical signal. Either a light emitting diode (LED) or a laser diode is used as the light source. The Engineering360 SpecSearch database characterizes fiber optic transceivers by three sets of performance criteria: transceiver, receiver, and transmitter. Clock recovery, a product feature, can also be specified for high-speed serial data streams. Buyers of fiber optic transceivers need to specify the cable and connector type, and requirements for wavelength, operating voltage, data rate, and bandwidth. Light source is a transmitter specification, but generally determines the choice of a cable type. When selecting a light source, transmission distance is a key consideration. LEDs are used mainly for short-to-moderate transmission distances. Their spectral output is very broad, but far less focused than a laser. Laser diodes are more expensive than LEDs, but are required for long-distance transmissions. Typically, three types of laser are used: Fabry-Perot, DFB, or VCSEL. 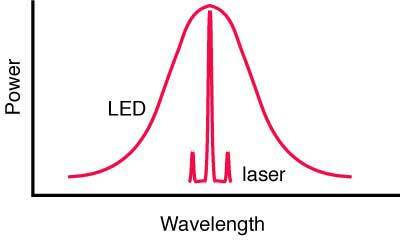 This chart describes the relationship between power and wavelength for LEDs and lasers. Fiber optic transceivers are designed for use with single mode or multi-mode cable. Single-mode fibers (SMF) transmit infrared (IR) laser light at wavelength from 1,300 to 1,550 nm. They have small cores and are used withlaser sources for high speed, long distance links. Multimode fibers have larger cores and are used mainly with LED sources for lower speed, shorter distance links. The typical transmission speeds and distance limits are 100 Mbit/s for up to 2km, 1Gbit/s to 220-550m, and 10Gbit/s to 300m. Products that can be used with both types of optical fiber are also available.